I recently upgraded from an original Apple Watch to a newer Series 1, and I’ve begun to search for truly unique and useful accessories. The majority of bands for the Watch are duplicates of Apple’s assortment of bands, but my search did lead me to an awesome type of band that’s really attractive and unique: wooden Apple Watch bands! 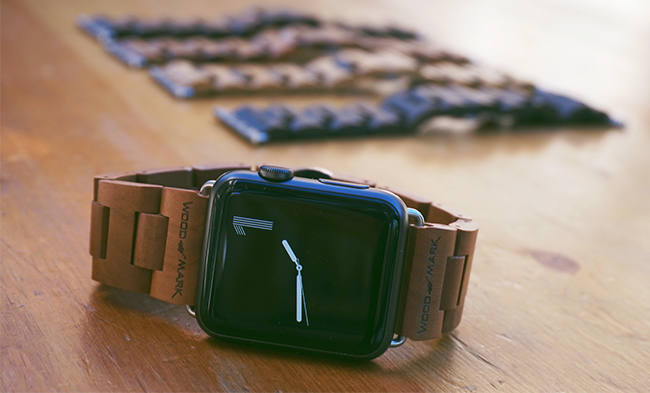 Wood Mark Watches out of Florida has a beautiful line of bands made from various woods, with a line of Apple Watch-specific wooden link bracelets. The materials, shown in the above image from left to right, are: black sandalwood/zebra wood, zebra wood, bamboo/black sandalwood, black sandalwood, and apple wood. The apple wood version (far right) is a limited edition that has just been released. All bands are link-style with stainless steel mounting hardware and clasps. Bands are available from Wood Mark for both the 38mm and 42mm Watches for $79.99. I’m happy to say that the band clasps hold firmly all day, something I have not always experienced with 3rd party link bracelets. The variety of band colors and styles is great, too, as some are more casual/everyday like the apple wood or bamboo bands, while the all-black sandalwood is classy enough for formalwear (see photo below). It would be nice to have the option to change the hardware color (that part attaches the band to the watch) to black so that the color fits seamlessly with the Watch hardware. As with other link bracelets on the market, the hardware to size your band is included, but be extra gentle during the initial resizing process. Wood is more delicate than steel, so you’ll want to take care to avoid scratching or cracking a link in the process. 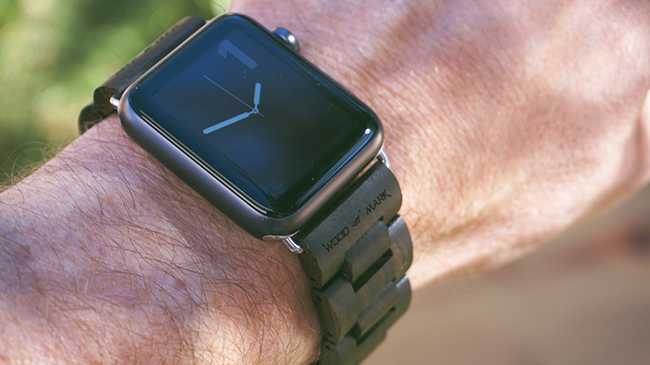 We’ve teamed up with Wood Mark to give 5 readers of Simple Guy Stuff their own Wood Mark Apple Watch band (a $79.99 value), and it’s simple to enter. Just leave a comment on this blog post with your band style of choice and your watch size (38mm or 42mm), and you’ll be entered to win the giveaway! Note: comments have to be approved and may not show up immediately. One entry per person. Open to U.S. residents only. We’ll draw 5 names at random from the comments on December 6, 2016, confirm your style choice, and Wood Mark will ship you your new Apple Watch band. This entry was posted by admin in electronics, gifts and tagged wood apple watch bands, wood mark, wood mark apple watch bands, wood mark wood, wooden apple watch bands on November 22, 2016 . Great review. Would love the apple wood one, 42mm. Thanks! These look awesome!!! 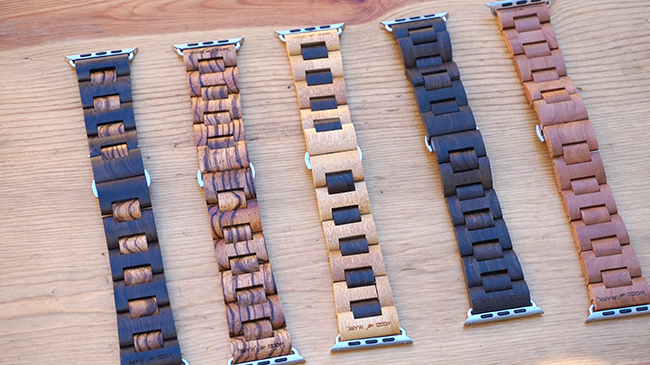 Would love the Apple Wood one for my 42MM Apple Watch. Thanks! These are sweet! The black sandalwood is my favorite with black sandalwood/zebra wood a close second! Love the black sandalwood! It would look great on my 42mm series 2! Zebra wood 42mm looks great! These look nice! I would love a 42mm Apple Wood band. Thanks! Love the bands — I’m glad to see some unique options come out for the Apple Watch. I love watches and the Apple Watch makes it hard to switch between them, but at least bands can show some of my character. I’d love the Black Sandalwood and Zebra wood band. For the price, these look phenomenal! Incredibly well crafted by the looks of the pictures, the black sandalwood especially. Would love one for my 42mm! Nice! I’m in for a 38mm zebrawood! These are beautiful! Black sandalwood/zebra wood 42!!! Cool bands. I think I like the black sandalwood the best. 42mm. I would love to have one of these! These look awesome! I would like a 38mm one. Very unique band! I’d love to show off my series 2 with a black sandalwood/zebra wood band. 42mm black sandalwood would be amazing! Would love to have the black sandalwood in 42mm. Looks fantastic! I love the black sandalwood/zebra. 42mm. These look so different from all other Apple Watch bands! They look great! Give me one of those nice 42mm Applewood bands! These are amazing!! Would love the Applewood 38mm. If I win, I would like the Apple wood band in 42mm. I’d love to win the 38mm Black Sandalwood band. That quick clasp system looks amazing! Wow! Those are definitely unique and awesome looking. My personal favorite is the black sandalwood 42mm! That bamboo one looks amazing! I would take any of them!!! The Apple wood one looks awesome! I would love to pair this with my 42mm so that I can have a fancy looking band for work every day! Wow! These look amazing! I would love to try out the zebra wood band in 38mm. It looks like a perfect balance of light and dark. These are incredible! I would like the black sandalwood in 42mm. Black Sandle Wood or Apple Wood in 42mm!!! These bands look great! An applewood band would look great on my 42mm watch. Loved the review! I would appreciate a 42mm zebra wood! These are awesome! I’d love he apple wood band for 42 mm! 42mm black Sandalwood is what I’d choose. Thanks so much for the giveaway! Great info here too.